GroundSchool - All Titles download Help Current for 2019! The single 'big download' file exists for those of you who might want to try or purchase multiple FAA written test preparation titles at once. For example, you might know that you want Private Pilot, IFR, Commercial Pilot right now. 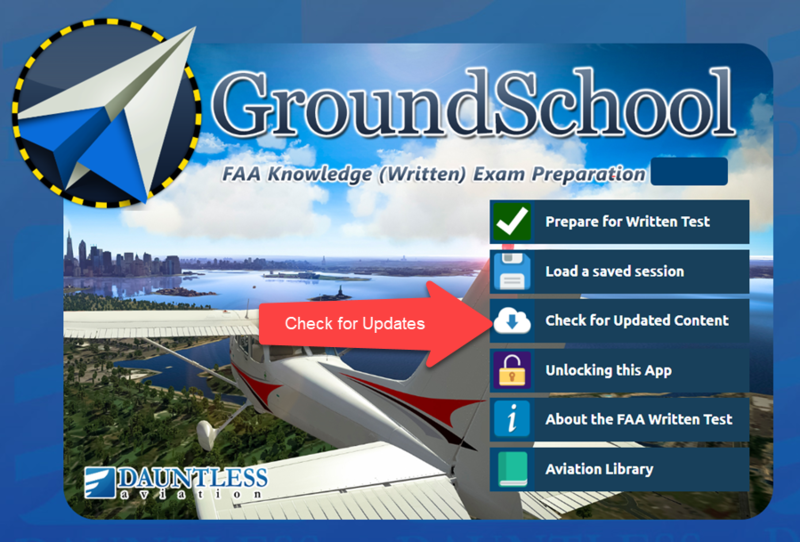 This single, quite large download includes all of our FAA Knowledge Test prep titles. You are welcome to download and install them. If the download is too large for you, there's an alternative (and recommended way) to get exactly the titles you want. Simply download and install any one title that you are interested in (for example, Private Pilot) and then, from the program's main menu (once you have it running), click on 'program updates check.' From the 'program updates check' screen, you will be able to install any and all additional available test groups. For some of you, downloading a file of the size of the 'all tests' large file will not be possible due to network traffic conditions or perhaps even restrictions at your ISP or other issues. If this is the case, please refrain from writing us via our helpdesk about this issue, as this would be due to an ISP issue, almost certainly at your end, that we are powerless to do anything about. Should you wish to download multiple titles there, please follow the steps listed in the previous paragraph. You can download the single large package below or click your browser's back button to download the individual package of the titles you were looking at peviously. includes everything - Private through FE/ATP + Mechanic.